Module r.futures.devpressure is part of FUTURES, land change model. 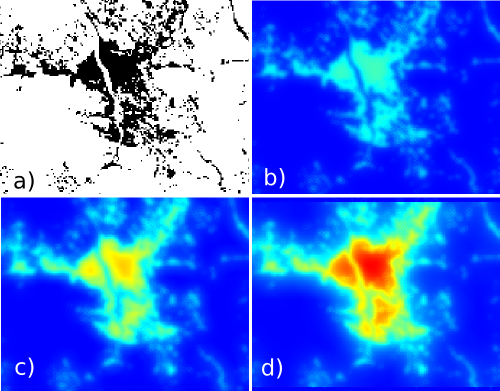 It computes development pressure, a predictor based on number of neighboring developed cells within search distance, weighted by distance. The development pressure variable plays a special role in the model, allowing for a feedback between predicted change and change in subsequent steps. There are multiple options for calculating development pressure in the model. Coefficient gamma is the coefficient controlling the influence of distance. The best value for gamma is chosen during the model selection process (TODO). The input raster is binary, value 1 represents development, value 0 no development. The neighborhood size describes the size of the moving window in cells (2 * size + 1). Figure: Effect of parameters size and gamma: a) initial development, b) gamma = 2, size = 10, c) gamma = 1.5, size = 10, d) gamma = 1.5, size = 20. By default NULL values are propagated. This means that the edges of resulting map will be NULLs. To avoid that, flag n internally enlarges the computational region, converts NULLs to zeros, performs the computation and then patches back the original NULL values. Module r.futures.devpressure, although written for FUTURES model, is general enough to be used for different applications where distance pressure can be described with the functions above.